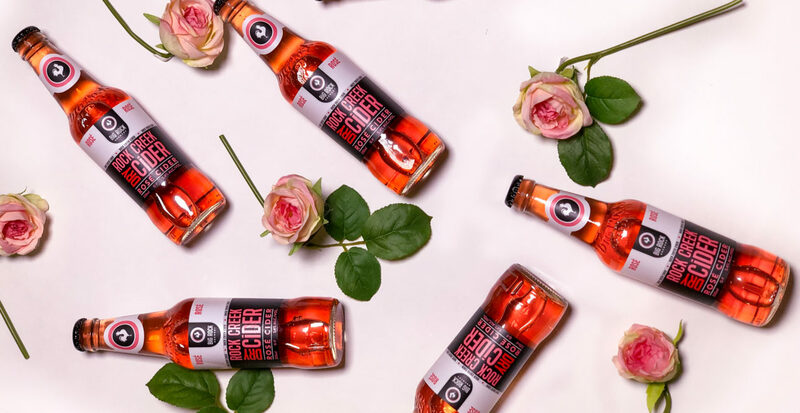 Just in time for Valentine’s Day, we’re launching a brand new Rosé Cider as the latest addition to the Rock Creek Cider family! But wait, what is a Rosé Cider? Is it a wine? Is it a cider? Inspired by rosé winemakers, this pink-hued premium dry cider is hand crafted with 100% Okanagan fresh pressed apples as the number one ingredient. Bulmer’s Norman, Belle de Boskoop and Bramley apples – all English-style cider apples originating from Europe – make up the delicious hard cider base, and Champagne yeast, natural rosé wine flavour, and spices bring the recipe to life. You won’t find any artificial flavours or colouring on this ingredient list, and like all our Rock Creek Ciders, it’s naturally gluten free and vegan. When and how should I enjoy Rock Creek Rosé Cider? This cider is a refreshing and more sessionable (lower alcohol, better for you) alternative to rosé wine, or if you just want a break from beer, and can be enjoyed as is from the bottle, or poured into your favourite wine glass with ice. In a beautiful clear flint glass bottle, it’s as fancy or laid back as you want it to be. Think cocktail parties, brunches, backyard gatherings, or just enjoying it on your favourite patio on a sunny spring afternoon. Where can I find Rock Creek Rosé Cider? Our Rosé Cider is available for a limited time only at our Calgary brewery beer shop and select liquor stores across Alberta, British Columbia, and Saskatchewan. Pop in for a taste, and pick it up for that special someone today! Check out our Rosé finder here.